Connemara is home to the most pristine landscape of mountains, bogland, and lakes set on the brink of the Atlantic Ocean, and it is located along the Wild Atlantic Way—a breathtaking scenic route in County Galway along the west coast of Ireland. It is these very conditions that have given birth to the Connemara pony and its renowned sure-footedness, intelligence, and patience. But Connemara also faces challenges as its peripheral location, weak infrastructure, and narrow economic base lead to low levels of employment opportunity. This makes it even harder to ensure that everyone in the community has an equal chance at a high quality of life. 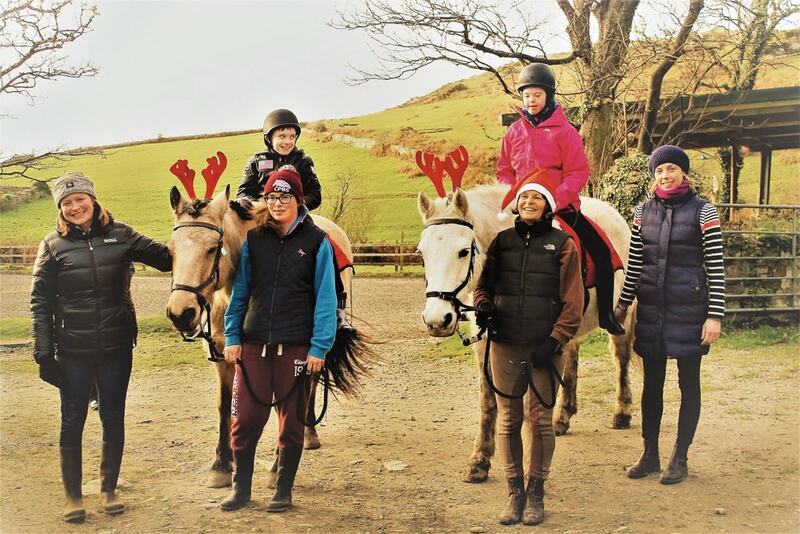 Our local disability support group, Paving the Way, took a leap of faith and approached the Connemara Pony Breeders Society to assist them in securing European funding with the support of Forum Connemara, our local community development company, to train therapeutic riding coaches. CTR commenced operations at Errislannan Manor Equestrian Centre in July 2015 by hosting taster sessions for all the members of Paving the Way and interested families. A group of our supporters, including parents, coaches, and leaders, attended the annual Clifden Connemara Pony Show to promote our service and raise some much-needed funds. We went on that summer despite some poor weather to deliver sessions weekly, continuing into the winter months. Other work included the creation of our logo, which the coaches and many of the riders now wear with pride on polo shirts and hoodies. Progress in 2016 included the decision to undertake a large fundraiser to help the service expand. The ‘Pony Poo Lottery’, which was a novel idea from one of the committee, was held in the Connemara Pony Breeders Society showgrounds in Clifden on 1 May 2016. These funds have facilitated the creation of an all-weather surface sensory trail in Errislannan. Furthermore, John Dooley—a final-year student of GMIT Letterfrack National Centre for Excellence in Furniture Design and Technology, created a sensory station as part of his final year project. This beautiful piece of art takes pride of place on the trail. Forum Connemara was successful in receiving a year of government funding to employ an animator/co-coordinator to manage and grow the service. But while all this progress is fantastic, the real magic for those of us with a commitment to this project is seeing the riders flourish from their experience of the service. For each participant, therapeutic riding brings something different to their lives. For one little girl, it is an afternoon spent in the company of her father and the various animals (aside from the ponies) that live at Errislannan. The ability to ride to places on horseback that would be physically impossible for her otherwise is the ultimate freedom. For one teenager, it’s riding alongside his little sister, enjoying an activity together and learning along the way. One of our riders attends during school hours along with his SNA (special needs assistant). For him, it is a new way of learning without the anxieties that a classroom can create. As he mounts that pony, it’s incredible to see him relax and engage with the world and the people around him. His giggles are infectious as he has a trot or two, and it would melt the hardest of hearts. There’s the girl that shows her parents every Monday morning using sign language that she is looking forward to riding after school that day. She waves them goodbye as she heads off on her pony; this is the highlight of her week. There are the two little boys, brothers, who ride out together, like cowboys. One chatters along the way, the other quiet and at peace with the world. It is recognised worldwide as an aid to improving and promoting educational skills, as well as being a healthy and fun activity, and can be described as ‘physiotherapy on horseback’. By its very nature, therapeutic riding works on many levels to support children and adults with a variety of physical, cognitive, emotional, and developmental needs. It is recognised worldwide as an aid to improving and promoting educational skills, as well as being a healthy and fun activity, and can be described as ‘physiotherapy on horseback’. We welcomed a fellow therapeutic riding project, 4STEPS, from Maryland, USA, in the summer of 2016. They were overwhelmed by the very essence of all Errislannan Manor has to offer—not just the services to the participants but also the sense of respite felt by everyone in the beautiful gardens and scenery. A visiting professor of social work in Lourdes University, Ohio, will bring students to volunteer and carry out academic research on the benefits of the project this summer. All this will culminate in the presentation of their findings to HETI (Horses in Education and Training International) in 2018 in Dublin, Ireland. CTR has hosted almost four hundred TR sessions since its launch in 2015, and all of this was made possible by the hard work and dedication of the voluntary committee and dozens of volunteers. Without this outstanding community support, this service could not continue to thrive. Their ongoing efforts have led to the facilitating of local primary school special education classes on a weekly basis. Our plans for 2017 include the development of a unique tourism package where we will receive visitors from overseas to our service. 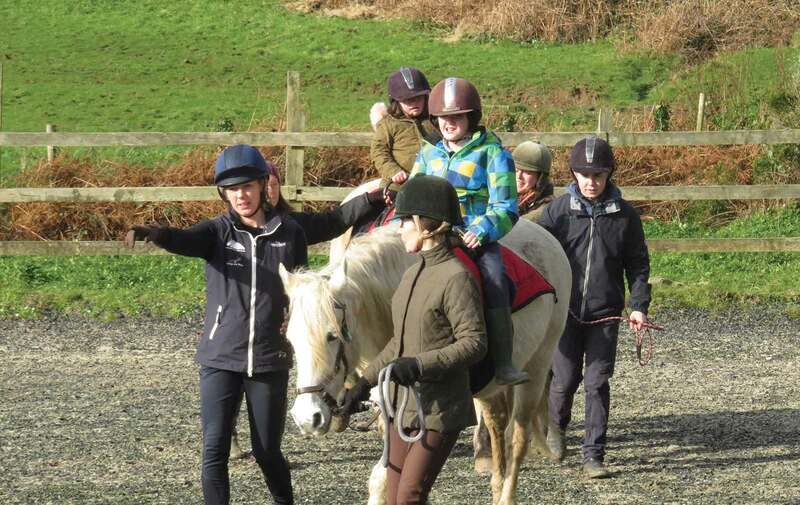 This exciting venture will mean we can offer tailor-made therapeutic riding sessions to holiday makers with disabilities who may not normally be able to access such services. Many of the riders reap the rewards of improved social, communication, and language skills. The various sensory input while out on the trail also assists in improving balance, coordination, and self-esteem. The amazing thing is it is not just the riders who are benefitting. Parents are seeing the benefits too, not just in the developing skills of their children, but also in having ‘time to just sit and be’ as one mother so nicely put it. All smiles in the arena from the TR coaches, volunteers, riders, and ponies. One could say that there is a felt sense—an ethereal quality—to the therapeutic riding experience for all in the beautiful surroundings of Errislannan Manor and stables. As their sons and daughters are safe and happy with the coaches, the parents have a stroll in the gardens, sit and read a book, or just relax on a bench watching the world (and several chickens!) go by. For the parents, it’s also the joy of seeing their children happy, learning, and in several cases, enjoying an activity with a sibling. Right from the inception of this project, we wanted to create a socially inclusive service, where all the family is welcome. We have succeeded! Perhaps the highest compliment CTR can be paid is from a mother who said, ‘this is the one place in the world where I feel my children are truly accepted’. The coaches and volunteers experience benefits also. They are getting to meet and know the unique families and individuals involved in this project. They are seeing the results of their input, as week by week the riders are developing new skills and forging relationships with both the ponies and the coaching teams. They see the smiles on the faces, the trust in the eyes, the laughter, the fun, and the feel of that little hand in theirs as the children put their trust in them. They’ve seen the tears in the parents’ eyes, the pride as a mother hears a new word, or a father witnesses the new stronger bond between siblings. And what of the staff and the Brooks family of Errislannan? 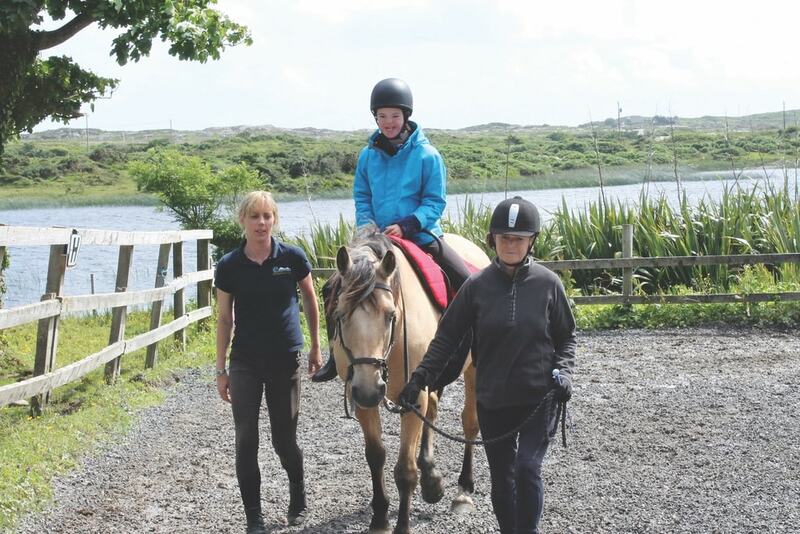 Connemara Therapeutic Riding has enjoyed their warm and generous hospitality as they share their magical location with us and delight in our success. They are seeing a whole new life being breathed into their beautiful surroundings, a new group of the community enjoying the indescribable beauty of Errislannan, and a genuinely inclusive and unique project developing in their midst. And they must be feeling an overwhelming sense of pride when they see their Connemara ponies bringing such joy to so many lives. We should all be proud of our very special native horse who is lending itself perfectly to this new role. Without any specialized training, these ponies are proving to be the perfect therapy pony—calm and placid, seeming to innately understand what is required of them. If you would like to learn more or support our service in any way, please feel free to get in touch at connemaratr@gmail.com or follow us on Facebook for regular updates.